Believe it or not, I am a real person. As such, I do not like to waste food that I spent a long time cooking. So when I make something like Eggplant Parmigiana that only uses half a batch of marinara sauce, I have to make something with the other half immediately! Fortunately, my marinara sauce recipe is pretty amazing, so any excuse to eat it is a good excuse. 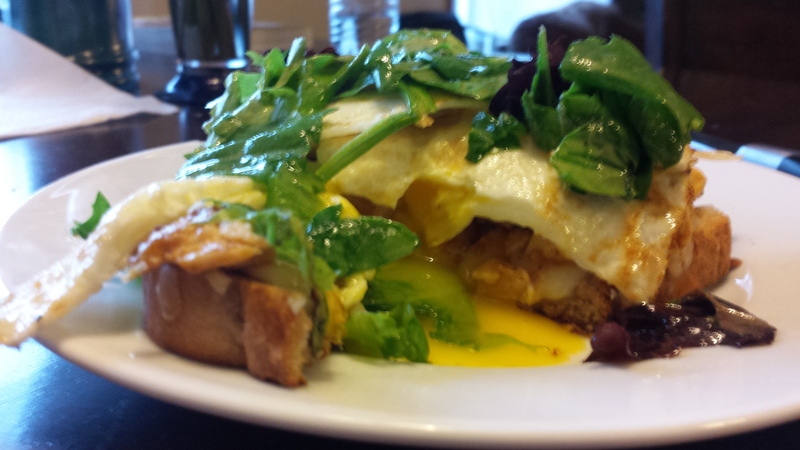 This dish has jumped right up onto my list of favorite breakfast meals. It is warm, comforting, flavorful, and easy to make. Did I mention healthy. It is healthy too! It is a skillet full of vegetables and eggs. 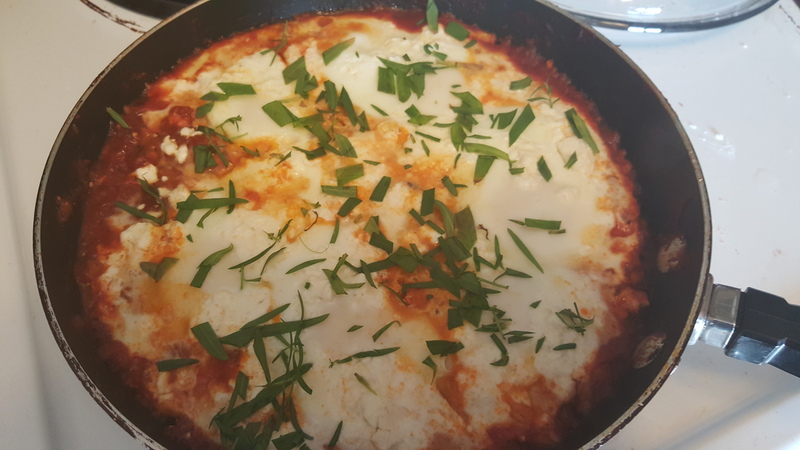 Shakshuka is traditionally a breakfast dish, but it would also work for a lunch or light dinner. Just serve it with some crusty bread, or even pita or challah, to help soak up the extra sauce. Or skip the bread if you are cutting carbs, whatever floats your boat. This dish is delicious either way. Since I used the leftover sauce from another dish, my sauce had been sitting in the fridge for a couple days. This is actually a good thing, as it lets the flavors marinade together to give the sauce greater depth. 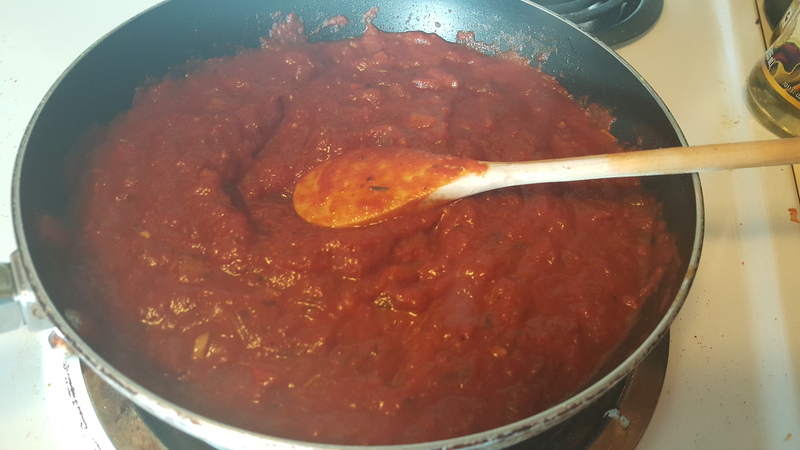 If you don’t have any sauce already made, I will give the recipe below (for a half batch), but really any red pasta sauce will work for this. The only thing you have to add is about a teaspoon of cumin, and half a teaspoon of smoked paprika. That’s it. 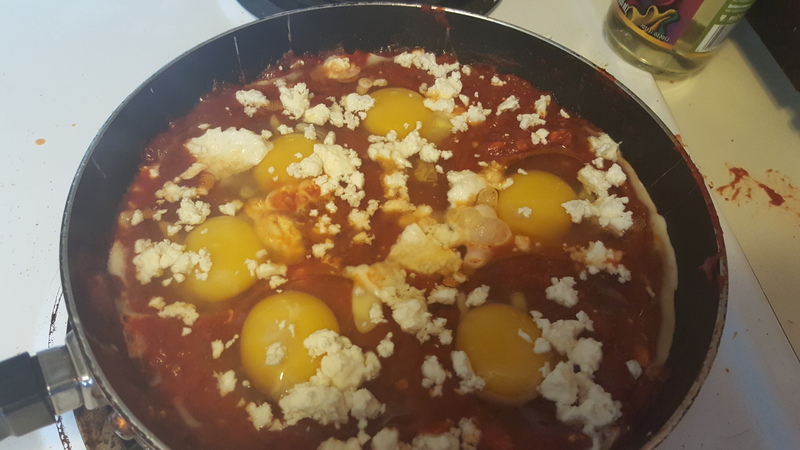 Shakshuka is also pretty fun to say. Heat olive oil in a skillet. 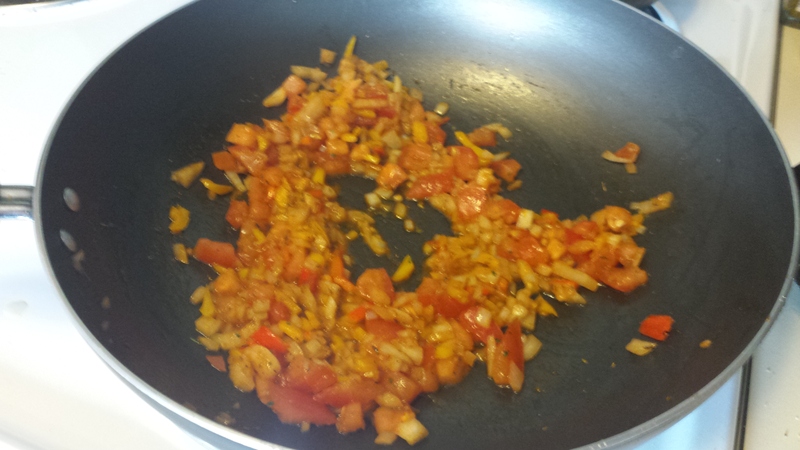 Add onion and bell pepper and cook for about 8 minutes, or until the onion is translucent. Add the garlic and cook for another minute. Add tomato and cook for about 5 more minute. Finally, pour the crushed tomatoes, tomato paste, and seasonings in the skillet. Bring to a simmer and cook down for about 15 minutes. 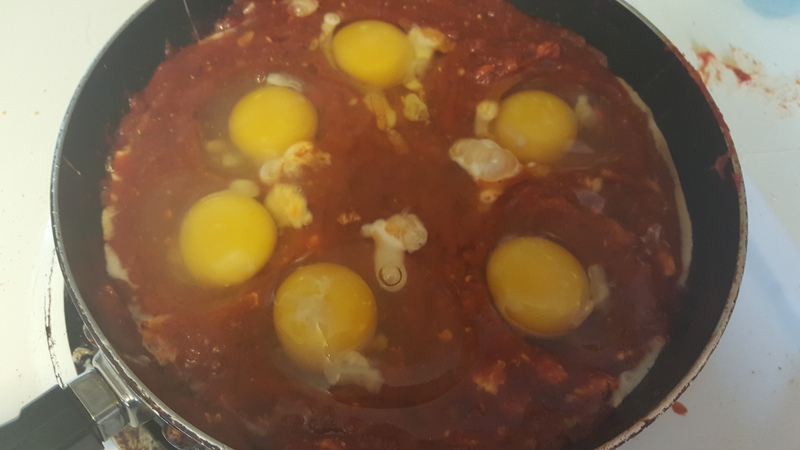 Crack the six eggs over the top of the sauce, evenly spreading them out. Sprinkle feta over the skillet. Salt and pepper the eggs lightly. Serve with bread if desired to mop up the extra sauce. Or just eat it up the way it is. I promise I won’t judge. One of my favorite parts of summer is making breakfast. During the school year, I have to be at work (as a middle school teacher) before 7:00 AM. Breakfast turns into a cup of coffee on my way out the door. 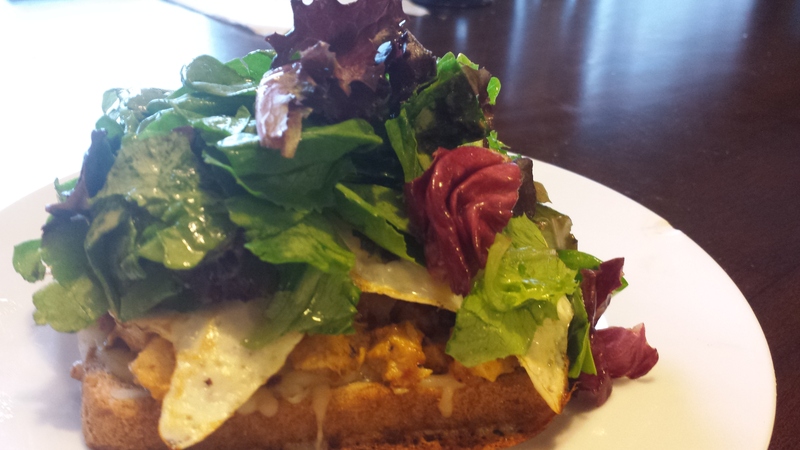 On the weekends I am helplessly lured by the many amazing brunch places in the twin cities. Cooking breakfast at home is a rare occurrence. So in the summer, I rejoice in it. Fiance and I have gone through enough eggs this summer to feed a small horde of hipsters at brunch. It is magical. One reason that we are drawn to brunch restaurants is that Fiance and I have very different ideas of what makes a delicious breakfast. He loves anything sweet and covered in syrup, while I am drawn to the spicy and savory side. When I cook at home, I win this battle. Because I am the one cooking. Nevertheless, he sighs, and groans, and dreams of strawberry stuffed french toast. This recipe won him over. In fact, it has won over everyone who tasted it. Except Obi. 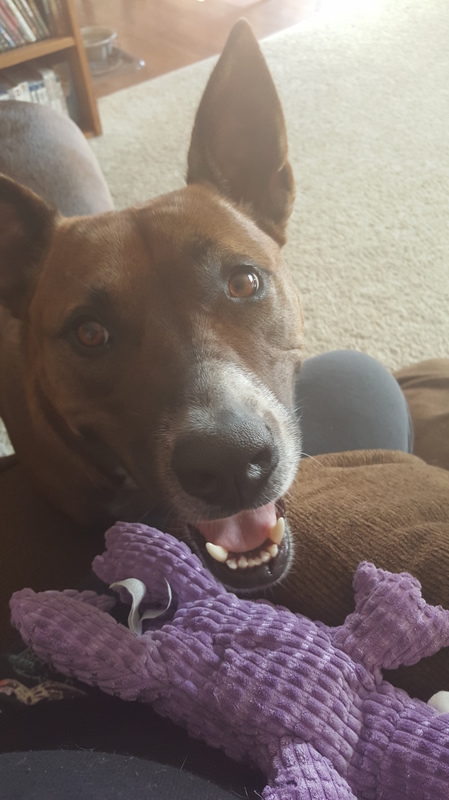 Who didn’t get to try it, and is really more interested in me throwing his new crocodile toy anyway. If chorizo isn’t really your thing, any other sort of diced or ground meat works just as well, just adjust the seasoning to match your taste preference. I love chorizo because it adds maximum flavor with minimum effort, but it does add a level of heat. 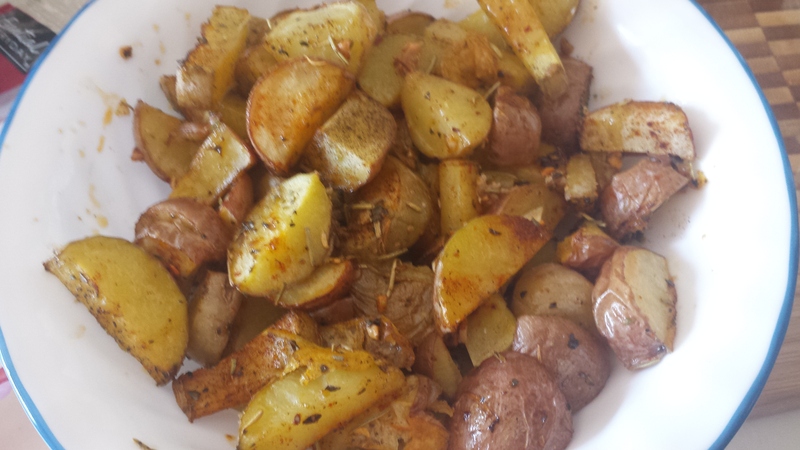 If spicy breakfast isn’t your thing use a milder flavor meat and tone down the spices used on the potatoes. Skip the chili flakes and cayenne and add more herbs or whatever else you want. The beauty of this recipe is that it is ridiculously easy to personalize! Finally, there are two ways to make this recipe. The delicious way, and the quick way. I am going to give directions for the delicious way, but if you are short on time this recipe can be shortened by putting the potatoes straight into boiling water after cutting them, boiling until soft, and then adding to the pan with the chorizo, vegetables, and spices. Mix and serve immediately. This cuts the cooking time about it half, but it doesn’t develop the flavors the same way and if you aren’t careful the potatoes overcook and the whole dish turns to mush. Which isn’t enticing at all. A reasonable serving for one person is about 1.5 red potatoes, however I tend to make twice as much as I need because it keeps beautifully overnight. Actually, it is almost better the next day after all the flavors have sat together for a while. You could definitely make this whole dish ahead of time and just heat up the hash and cook the eggs when you want it. Especially if you have a hungry family waiting. Pre-heat oven to 415 degrees fahrenheit. Dice the potatoes into about quarter inch cubes. 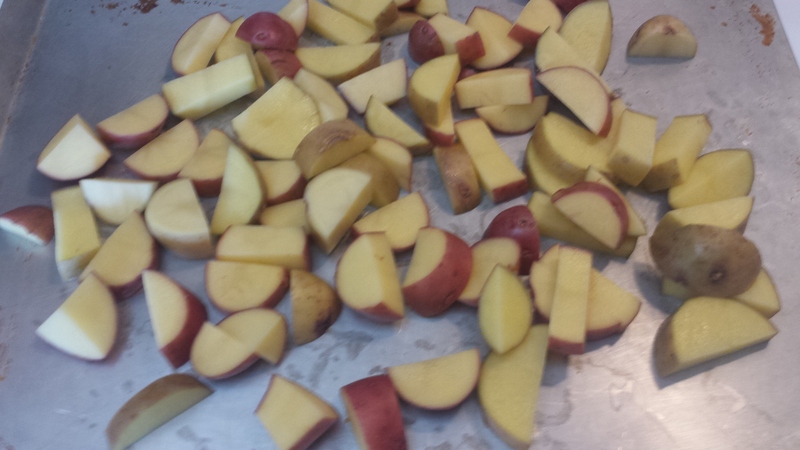 The smaller you cut the potatoes, the quicker they will cook and the more homogeneous the hash will be. Dice the onion and pepper into pieces about the same size. Throw everything into a 9×13 baking pan. Toss with olive oil and all the spices and herbs (everything but the eggs and chorizo should be in this pan). Spread the mixture evenly on the bottom of the pan. Cook for about 30 minutes, removing every 10 to stir so that it does not stick to the pan. After about 30 minutes, taste and add salt or spices as desired to bring the mixture to your desired heat level. The dish is done when the potatoes are soft. 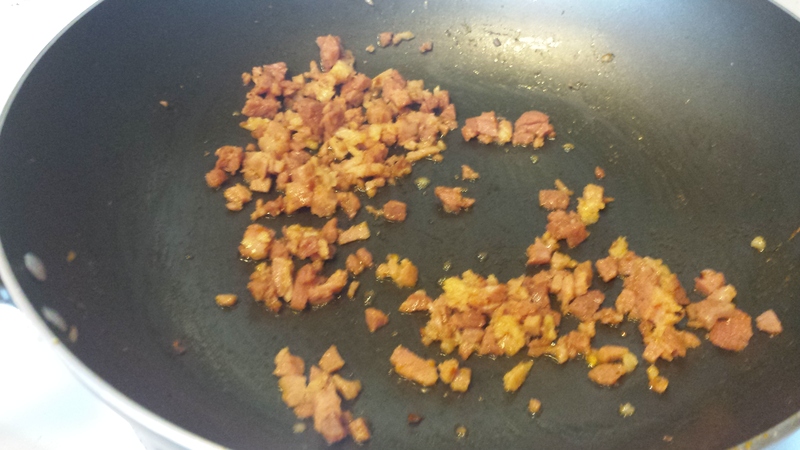 While the potatoes bake, cook the chorizo in a skillet over medium heat until done. I usually put the chorizo on a plate lined with paper towels to drain off the extra grease. When the potato mixture is done, mix it in with the chorizo. Cook two eggs per person, either sunny side up or over-easy. You want a good runny yolk! 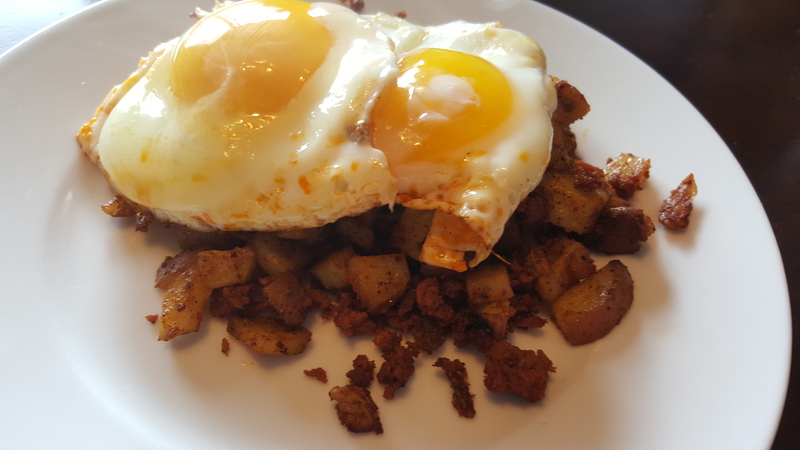 To serve, put the potato and chorizo hash on the bottom of the plate, and top with the eggs. When I was in college, I lived with two “culinary students”. This gave me a very bad vision of what a culinary student really was. My culinary roommates ate “organic” boxed macaroni, complained about how hard hollandaise sauce was to make, and tried to make my life a living hell. One of these people married the first helpless bloke that was willing to take her. The other seems to be busy trying to convince herself she is an artistic hippie food snob. Either way, my view of culinary experts never improved much. These culinary roommates of mine always ate a lot of frozen “organic” food. This includes frozen hashbrowns and french fries. They actually had me convinced–for a short while– that potatoes for breakfast was something only possible with pre-cooked, frozen trash. 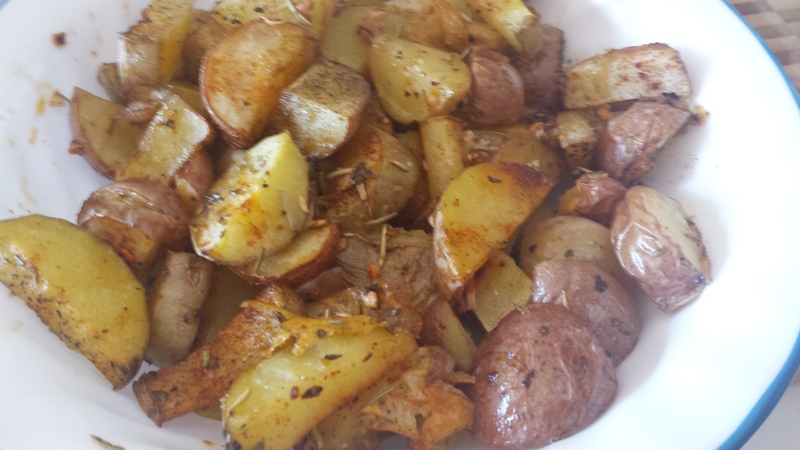 These potatoes are something I almost only make for breakfast, but they will work just as well for lunch or dinner. The reason for this is all of the delicious herbs that bridge the gap from crispy breakfast potato to luscious baked potato for dinner. No matter what you make them for, I hope you enjoy them. I served them with my Breakfast Sandwich and they were absolute perfection. Toss together all of the herbs and seasonings. Chop the potatoes into about 1 square cm pieces. and spread onto a baking sheet. Toss with the seasoning blend. Make sure the potatoes are spread out evenly over the baking sheet, so that none are on top of the other. This will prevent them from getting crispy. Drizzle thoroughly with olive oil. Bake at 400 degrees fahrenheit for 15-20 minutes. Serve immediately, with any main dish. Preferably something delicious and breakfasty and eggy. But that is just my opinion. Have I told you lately that I love breakfast? Not just any old breakfast. Overly sweet and sugary food is not my cup of tea in the morning. Eggs. Eggs are the bee’s knees in the morning and this post is dedicated to whoever first thought of eating the weird white round thing that comes out of a chicken. Balance is also important in the morning. Too much heavy food leaves you feeling bogged down, fat, and lazy. Breakfast should give you energy. 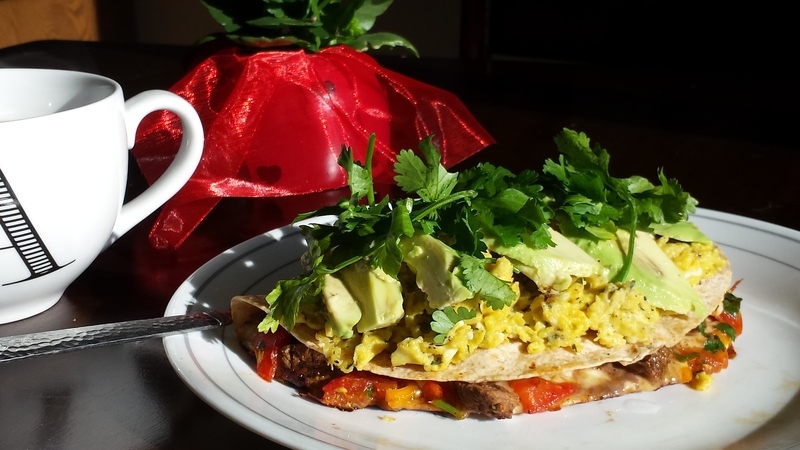 This sandwich is one of my favorite go-to breakfast meals because you get the protein, but it is also lean and healthy. It is also great, because you can use whatever protein you happen to have in the house. In the picture above I used some left over stir fry chicken with peppers and onions. I have also used ham, turkey, lunch meat, sliced steak, just whatever you happen to have in the fridge. Leftovers are perfect for this. You could also leave it meatless to make it vegetarian. Super flexible, super quick, and I don’t know what more you could want in the morning. 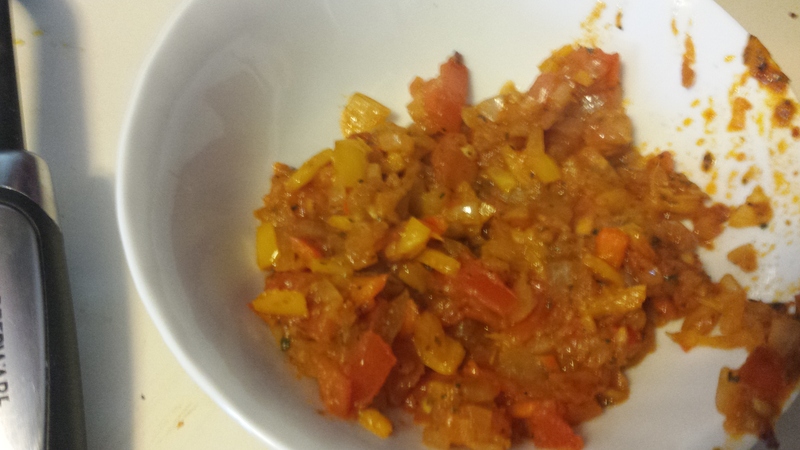 1/2 cup chopped meat or veggie combination of your choosing (e.g. chicken or steak with onions and peppers, left over stir fry, pulled pork, lunch meat, really anything! To serve, put the meat mixture on top of the cheesy bread, then the egg on top of that. Whisk together lemon juice, olive oil, and mustard with salt and pepper until emulsified. Toss desired amount in with the lettuce, then put on top of your sandwich. Serve immediately! It should look like this when all assembled. And like this after you cut into it. How can you NOT want to eat this? You’re gonna have a new favorite breakfast. Guaranteed. Saturday mornings are my absolute favorite day of the week. It is the only morning that I don’t have to go to work, and I get the whole house to myself. 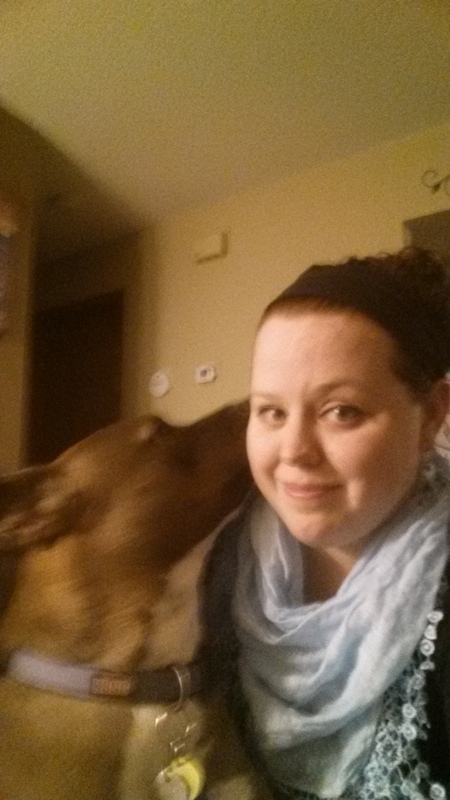 My fiance works on saturdays, so Obi and I are all by ourselves. This is my time to make a delicious breakfast that Matt won’t like (AKA not dripping in syrup). I am absolutely obsessed with tex-mex inspired breakfast food. Actually, not just the breakfast food. Anything with pico de gallo, avocado, cilantro, tortillas, cumin, and oregano in it has a path directly to my heart. My favorite of all time, however, has got to be the fabulous quesadilla. This last week, I made burritos for dinner. They were so awesome, Matt told me that they were the reason he was marrying me. This is a true story. These burritos had steak, pico de gallo, avocado, and queso chihuahua on them. 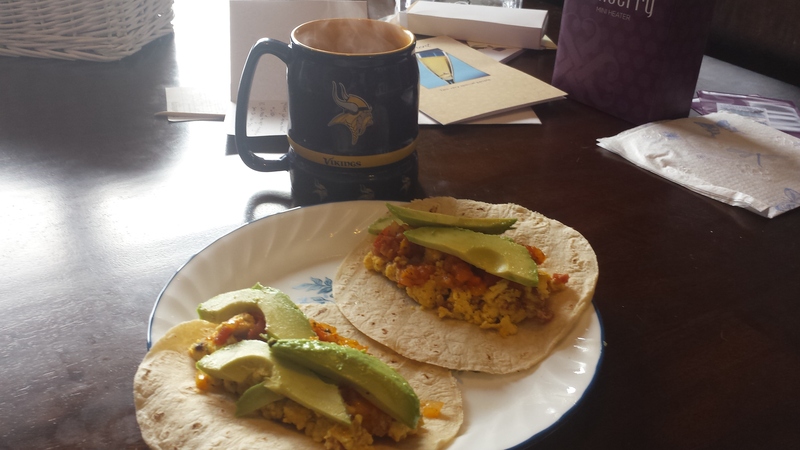 They were awesome, and they inspired an even better breakfast. 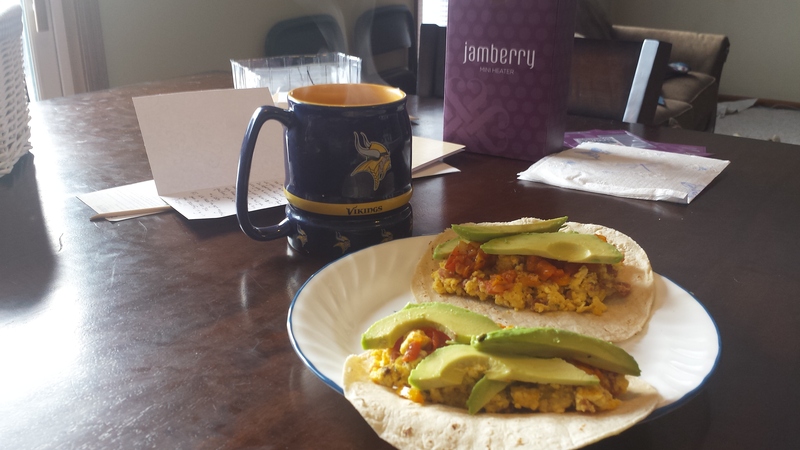 All I needed was luscious, velvety scrambled eggs to turn this into a breakfast. The trick to this meal, as usual, is not to skimp on any part of the dish. Every single piece of this dish is important to build the right flavors and textures. I used steak I had leftover from the previous night. My steak was rubbed with salt, pepper, garlic powder, paprika, oregano, and cumin, then cooked to a perfect medium rare. It went perfectly on my quesadilla, but you could use any other meat you happen to have in the house, or leave it meatless for a fab vegetarian option. 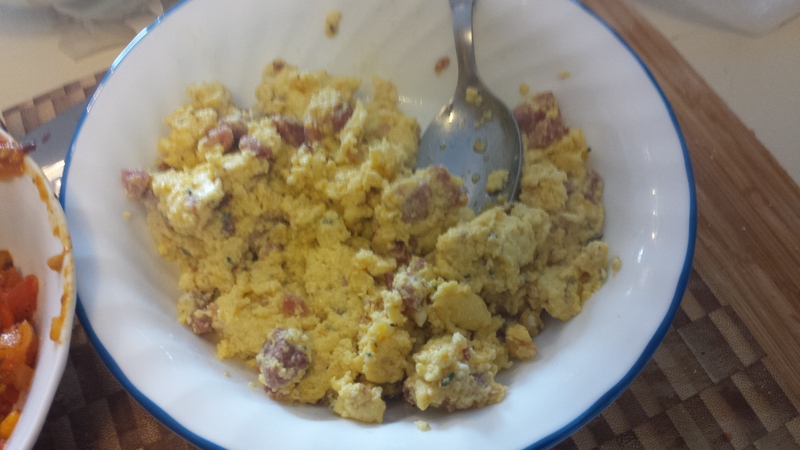 In a bowl, beat together eggs, cream, tarragon, salt, and pepper. Put in pan over medium heat. Stir regularly with rubber scraper to keep from sticking. Remove from heat when eggs stick together, but before they stop looking wet. Meanwhile, in another pan, heat a little oil over medium heat. When warm, lay tortilla down for about 30 seconds. Flip, and cover half of the tortilla in cheese and steak. When cheese is melted, add the pico de gallo and fold tortilla in half. Let cook for about a minute more, then remove from heat. 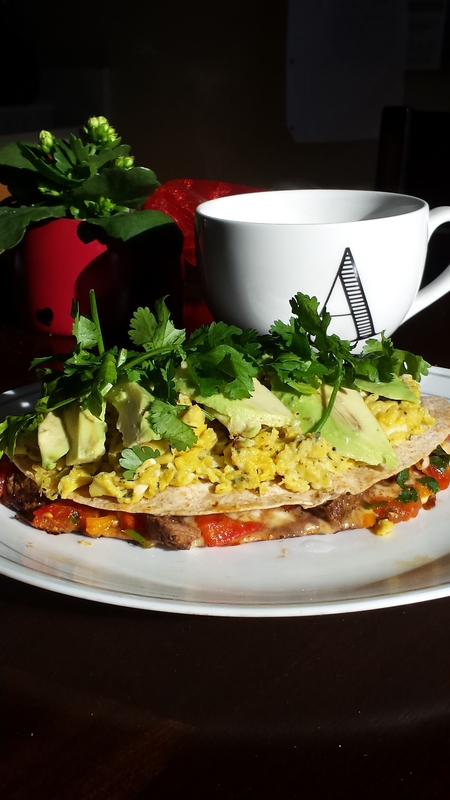 Top with eggs, avocado, and cilantro. Chop tomatoes, cilantro, onion, garlic and sweet peppers. Mix together along with seasonings. Let marinade in fridge for an hour before serving. I love tacos. Pouches of heaven. 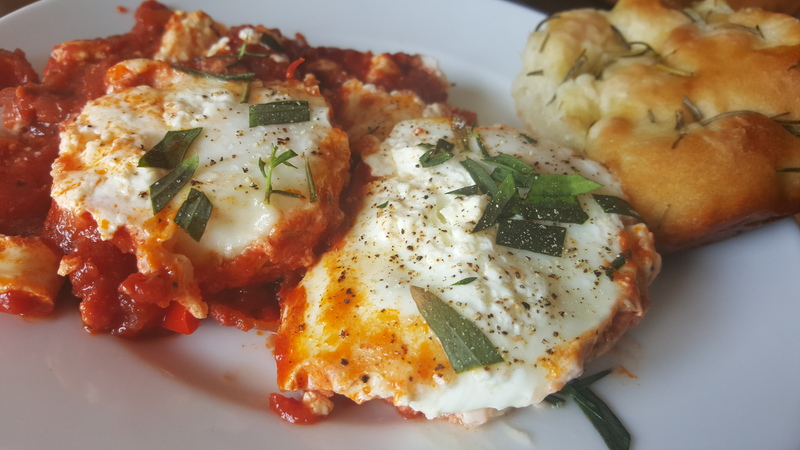 The best part is that when they are filled with all sorts of fabulous ingredients, you can get the perfect bite of everything, without getting bogged down by massive quantities of bread. Not that anything is wrong with bread, but sometimes you just don’t want it to be the star. Tacos are also a great way to help keep these a little lighter and healthier when you are on your wedding diet. Ahem. 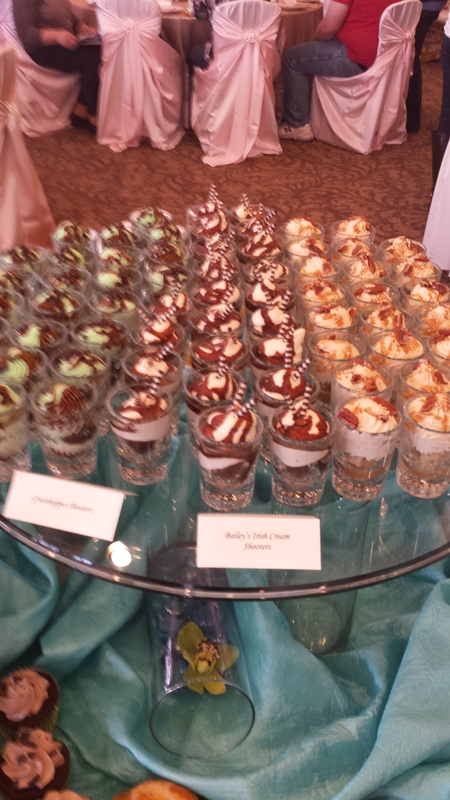 Especially when you went to a wedding fair at your venue the day before and ate an entire table worth of alcoholic dessert shooters. Anyway, so back on the healthy bandwagon. For now. Really, the trick with tacos is just to make sure every single ingredient is loaded with flavor. The second you decide you don’t need to season one part because another part will have “enough flavor”, your tacos are lost. Think layers of flavor. Like they are always talking about on those cooking competitions on the Food Network. I have to admit, this recipe was a bit of a letdown for my pancakes-drenched-in-sweet-sticky-syrup loving fiance. But unlike heavy, sweet breakfast that leave you feeling bloated and tired, this is protein packed and light. Great for a busy breakfast morning. It also only needs one cutting board, and one big pan. Fewer dishes is always good. Start with making a real quick, simple warm salsa. 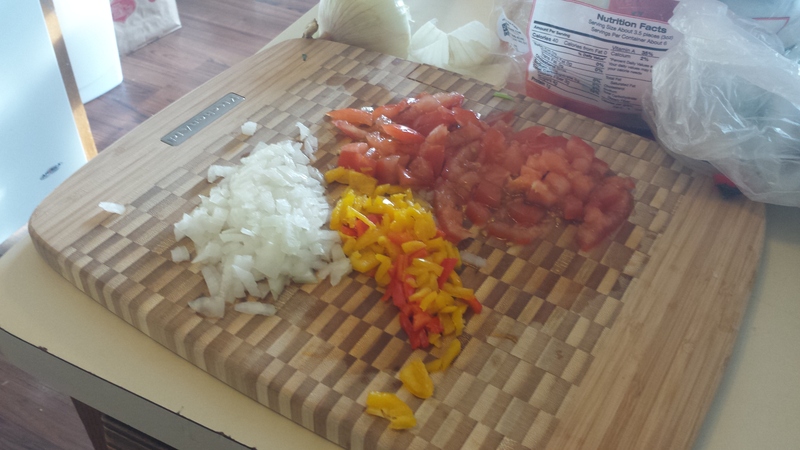 Dice up the tomato, onion, and pepper. Heat 1 T of the oil in a large saute pan, then add your veggies. Mix in pepper, salt, parsley, thyme, cumin, and paprika. Let cook on medium heat until is soft and the tomatoes are disintegrating. This should take about 5-8 minutes, depending on how small your vegetables were chopped. When it is done, put the salsa in a separate bowl and return your saute pan to the heat. Pour in the 2nd T of oil. Let warm for about 30 seconds, then add ham. I cooked the ham for 3-4 minutes, because I wanted it to get a little bit crispy. While the ham is cooking, crack the eggs into a large bowl. Beat until they reach desired consistency. Now for the magic. Add the greek yogurt to the eggs. I do this instead of milk, because the yogurt gives the eggs a fantastic fluffy texture, as well as being healthier. 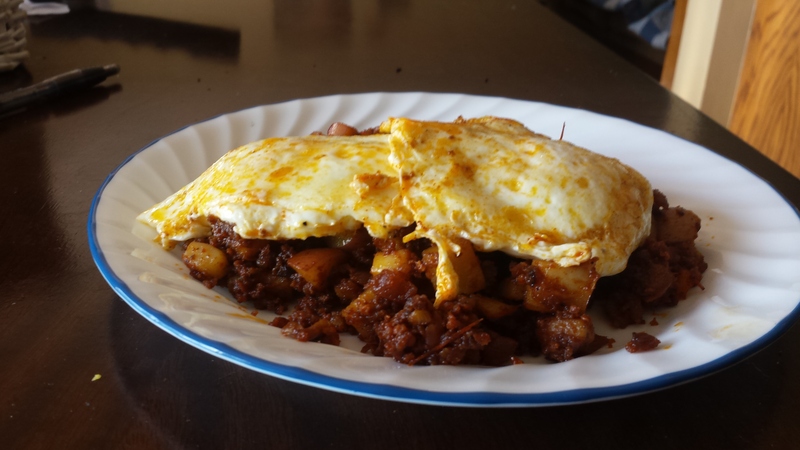 The tanginess is also fantastic with the eggs. You will have to beat the eggs pretty well after adding the yogurt so that you don’t have lumps. Mix in a pinch of salt and pepper, along with tarragon and cotija cheese. The tarragon is peppery and the cotija is salty, so you don’t need as much salt and pepper as you might normally add to your scrambled eggs. When the ham is crispy, pour the eggs into the pan over it. Stir together gently, so your eggs don’t lose their fluffiness. Continue to slowly mix, scraping the bottom, while eggs cook. When the eggs are about half way done, add cheddar cheese if desired. 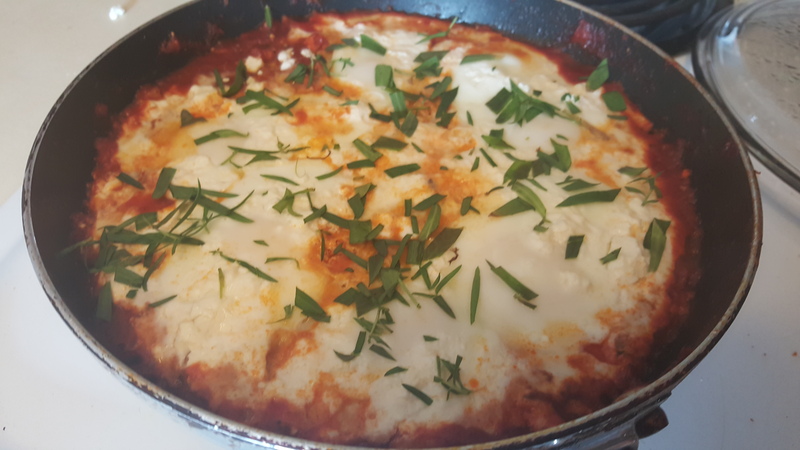 I like to add it here so that it doesn’t become completely contained by the eggs, and you get the delicious, creamy gooey bits of cheese throughout. Take the eggs off the heat when they start to look less wet. Don’t overcook! Heat the tortillas on a flat pan, or if you’re feeling lazy like me, on a paper towel in the microwave, until warmed through. To construct your taco, first put desired amount of egg in the middle of the tortilla. Top with salsa, and finally slices of avocado. If you have some sort of cabbage or crispy lettuce on hand you could absolutely add that for another textural element. I did not, so we did not have that. Enjoy with a steaming hot cup of coffee. And get ready for a great day! 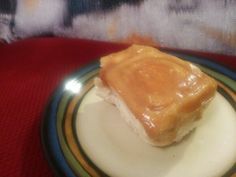 So I have tried many different caramel roll recipes. Some I liked. Some I didn’t. But none have ever come close to the way my grandma makes them. Warm, fluffy, dripping with carmel. That sweet cinnamon and sugar rolled up in fluffy light bread. My darling husband Daniel decided he wanted to make something for his early morning final to bring and share with them. lets just say they were a hit. This is also a very versatile recipe. The dough itself makes fabulous dinner rolls. And instead of caramel, these can be iced to make classic Cinnamon rolls. you could add raisins or nuts as your heart desires. So feel free to experiment! I will warn you that these take three hours to make if not a little longer but as usual, 2 of those hours are just letting it rise and cook and such. bring 2 cups water to a boil. remove from heat and add the 1/2 cup butter, white sugar, and salt. mix till butter is completely melted. add eggs and yeast. whisk till yeast is fully dissolved. let rest about 5 minutes. Add flour. Turn dough out onto a flat floured surface and kneed till proper consistence. dough should not stick to your hands and when held in one hand should sit still. Sprinkle a large bowl with flour. Place dough in the bowl, cover it with a towel and let rise till double. about one hour. While dough is rising make the caramel. Put the butter, white and brown sugar, and ice cream into a heavy sauce pan and bring to a boil, stirring constantly. let boil for one minute. remove it from the heat. Grease two 9×9 pans and pour half the caramel into each. When the dough is finished rising. turn onto floured surface and punch down till the air bubbles have been removed. Split the dough into thirds. take each section and roll it into a 12″ x 12″ square. cut each square into 6 longs strips. mix together the melted butter, brown sugar, and cinnamon. use a basting brush to spread the butter mixture onto the strips and then roll them up tightly. You will end up the 18 rolls. place 9 in each of the pans with the caramel in them. Bake at 350 for 20-25 minutes. Let cool in the pan about 10 minutes and then invert the rolls onto parchment paper so the caramel side is up and allow to finish cooling. P.S. If you are making Cinnamon rolls, skip the caramel and instead mix together 1 pint whipping cream, 2 tsp cinnamon, and 2/3 cup brown sugar. spread this over top of everything just before you bake it. P.P.S. I am pretty sure Daniel made an extra large batch of caramel for his so if you you take STICKY buns very seriously, feel free to make more, just keep the proportions the same.